HARVEY, La. 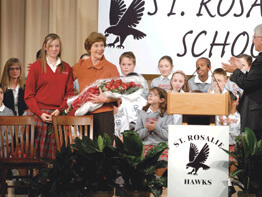 – Catholic schools played a “vital role” in the Gulf Coast’s path to recovery after hurricanes Katrina and Rita, first lady Laura Bush said on a visit to St. Rosalie Catholic School in Harvey. After her midmorning visit to St. Rosalie, Bush had lunch at Cafe Reconcile in New Orleans, a program of the New Orleans archdiocesan Catholic Charities. She pointed out that “New Orleans Catholic schools … opened their doors to thousands of public school students displaced by the storm. In Metairie, Archbishop Rummel Transition School helped hundreds of families return by taking students from any area school that closed. “Cathedral Academy welcomed the children of first responders who lived on mercy ships immediately after Katrina. Archdiocesan representatives spent three evenings aboard those mercy ships registering students, and they asked for no tuition,” she said. St. Rosalie principal Mary Wenzel told the Clarion Herald, New Orleans archdiocesan newspaper, that she learned just before Christmas that the first lady wanted to visit her school in January. The Harvey elementary school had received a $20,000 grant from the Laura Bush Foundation to help rebuild its library, but beyond that Ms. Wenzel said she had no real idea why her school was chosen. “But I know she felt that Catholic schools were not getting enough publicity for their part in recovery efforts, and she wanted to highlight a Catholic school,” Ms. Wenzel said. In preparing for Bush’s visit, Ms. Wenzel said, she spent a great deal of time on the phone with speechwriters from the first lady’s office, as did the pastor of St. Rosalie Parish, Salesian Father Jonathan Parks. The elementary school campus sustained nearly $2 million in damage but was back open by Oct. 3, 2005. Repairs to the middle-school campus are just getting under way and are expected to be completed in early June, in preparation for its August reopening. Middle-school students, meanwhile, have been attending classes on the Archbishop Shaw High School campus. Before leaving St. Rosalie Mrs. Bush said she was going to Cafe Reconcile for lunch because it is a place where at-risk youths “receive on-the-job training for a host of restaurant jobs – from waiting tables to serving as ‘chefs de partie.’” A “chef de partie” is a station chef or line cook in a restaurant. “In the weeks after the hurricane, Cafe Reconcile served hot meals to first responder and construction crews and local workers. The staff welcomed back evacuees one plate of red beans and rice at a time,” she said. 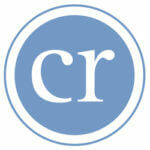 At Cafe Reconcile, Mrs. Bush met with the workers and had a lunch of fried catfish and greens and okra.